From 84th Street, go west on Barkley Drive to Boulder Ridge Road, turn right (south) on Boulder Ridge Road. House is located at 6411 Boulder Ridge Road. 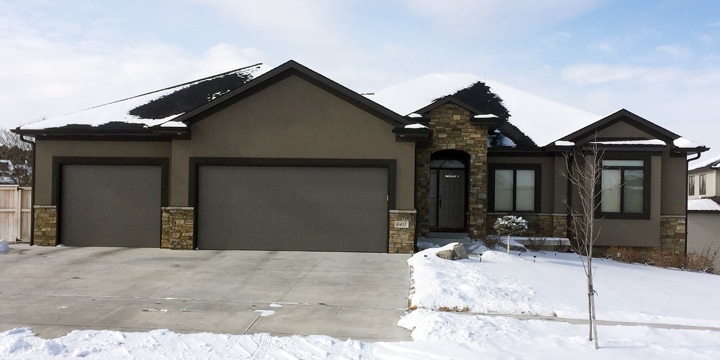 Neighbors Family Homes is pleased to present “The Lilly.” This custom Energy Star home has a HERS score of under 50 and features a geothermal heating cooling system. The Lilly has 2 x 6 walls, bib insulation and many other energy saving features. With well over 3,500 sq. ft. of thoughtful finish, this home has all the features you have come to expect from Neighbors Family Homes. The great room features a 10 ft. ceiling with corner fireplace with stone from hearth to ceiling. The kitchen boasts a walk in pantry, island and raised eating bar. The master bathroom has a tile walk in shower, private stool area and access to the walk in closet. This home is truly a beauty to behold with a very easy living design. The Lilly also includes all of the standard features you have come to expect from a Neighbors Family Home.